You just find a version that meets your expectations and call it good. Antico Forno Roscioli, where your pizza bianca (on the right) can be stuffed with any sort of deliciousness you desire (in this case, mortadella), and is eaten outside on whatever table or upside down barrel you can find. Kenji's recipe is probably pretty good. 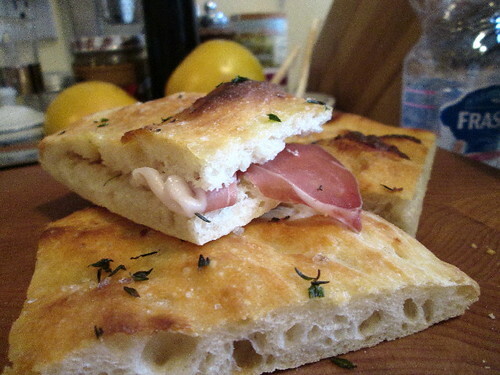 Wouldn't an Italian cookbook just say something like, "make a pizza bianca"? The Italian would say "buy pizza bianca"
"Remember that brewer's yeast and baking yeast are the same strain of yeast fungi, but they grow at different speeds. ... You will require less of the dry active yeast, which is made for a rapid one-rise recipe..."
Whereas the addition of malt is interesting, as the Lahey recipe (and any number of others) calls for sugar. And a number of them call for milk, too. But - I'm not in Rome, and I'm baking in a home oven, which obviously that recipe (from Roscioli, thanks by the way) has been converted to work in - as pizza bianca is generally baked in something like 6' slabs, right on the oven floor. The same strain but the bubbles don't end up looking the same because of the rate of fermentation. 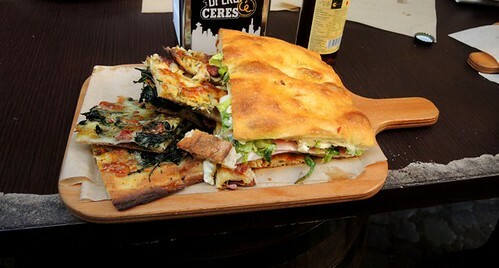 Focaccia is a bit more reasonable due to thickness. I've ordered that Roscioli book English version - interested to see if the recipe is the same. 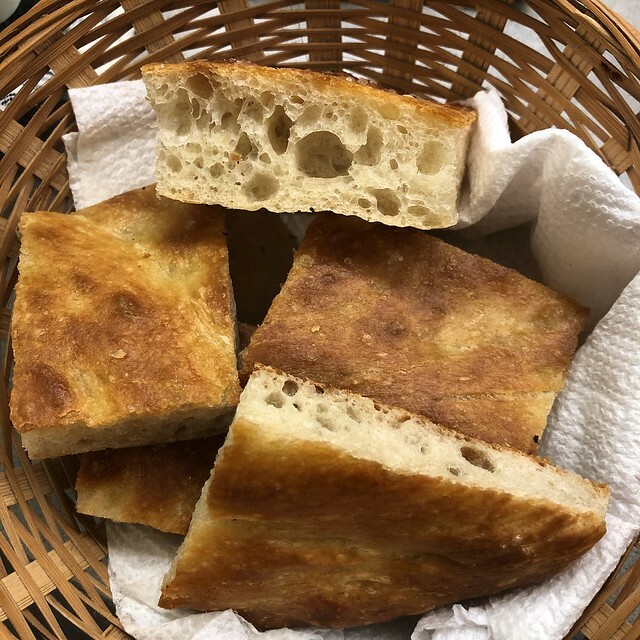 And I've had moderate success in the past - but as I mentioned above, don't remember what recipe/method used - or perhaps it was a mix of a number of recipes, and baked on parchment on a stone, then moved directly to stone. Love that it looks like a tongue is sticking out. We cancelled a little celebratory dinner party scheduled for tonight because of threatened flooding, not wanting to put guests in harm's way. But bread was set. 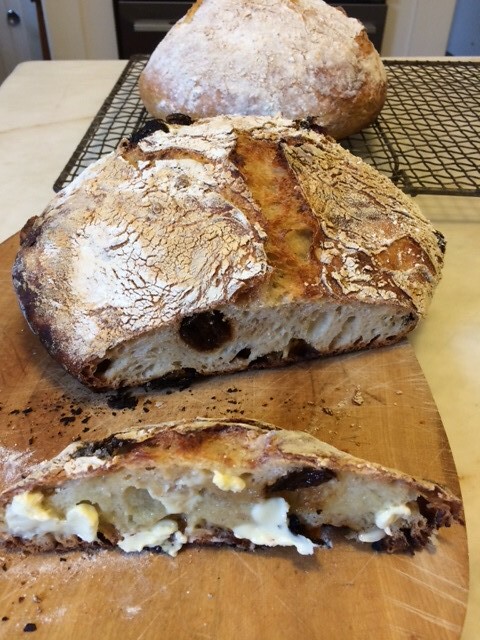 One plain country loaf and one raisin, intended for foie gras and cheese courses. So what can you do? Have a little bread and butter while it's warm. For a brunch we went to yesterday, N made an enormous (belated) Easter bread, using a mixture of bread flour and KAF white whole wheat flour. A little bit of spice went into the bread, along with rum-soaked dried fruit, but not much sugar, because running down the middle of the bread was (firm) rum custard, made with Bird's custard powder. Cinnamon-orange glaze on top. 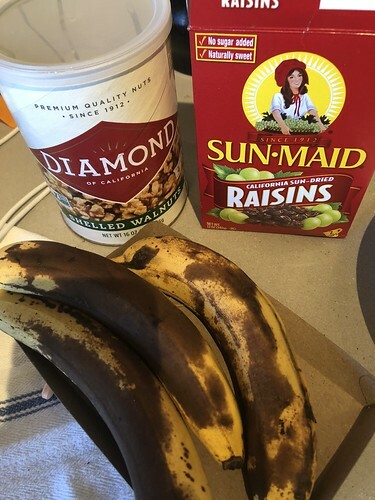 It's my standard, slightly bastardize banana bread recipe from Nick Malgieri's How to Bake. Last year a friend served us an amazing bread from Orwashers that was studded with cranberries, raisins and pistachios and redolent of orange zest. Shortly thereafter I discovered the recipe and have been wanting to try it. I finally had the time yesterday and I got to use the bread proofing setting on my oven! The recipe produces 4 loaves, so i baked off two and the other two are shaped and in the freezer. I've got to say, it's pretty damn good.